It might seem a little problematic for a character like Harley Quinn to be made as a toy in a line for young children, particularly one aimed at girls. With the way the character is portrayed in Suicide Squad, and even began in Batman: The Animated Series, Harley's not exactly a role model, nor is she a particularly progressive character. At least not at the beginning; over time, we've seen Harley break away from Mr. J to become an individual all of her own - still with a bit of the crazy, but who doesn't love that? - and that's how we find her in Mattel's neat DC Superhero Girls line. Harley Quinn is unorganized and unpredictable, but she is also fun; and even though her classmates don't always "get" her humor, she never stops trying out new material on them. Harley loves being the center of attention, even if it means acting like a clown. Harley's inclusion in this line was basically unavoidable; at this point in time, she's one of the most iconic female DC characters, and thus was destined to be a major player in the franchise including any toylines that hit. The sculpt here is very nicely done: this Harley very nicely catches the large bouncy character seen on the animated series, with a slightly larger head than usual giving her (and the other figures in the line) a more doll-like, more Barbie-esque look. Her costume is not dissimilar to the expected Harley Quinn garb across her appearances, bright and appealing. The paint apps are quite well done too, though you might have to take a closer look at the ones on the shelf to make sure you get the best Harley you can get. Unfortunately articulation and accessories are what let this line down, so let's start with the former. 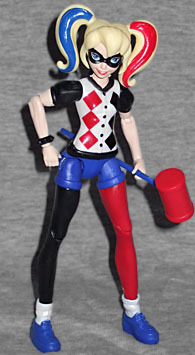 Like the other toys in the line, Harley Quinn is surprisingly articulated, featuring swivels at the boots and wrists, then swivels/hinges at the knees, hips, elbows and shoulders. 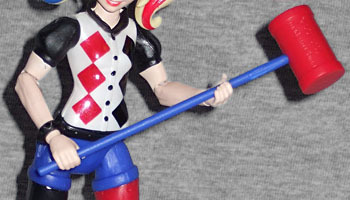 The lower body articulation suffices, and is stable enough so you can keep Harley standing, but the top half is limited; the shoulders need an extra joint to make full use of any shoulder articulation, and having a single joint at the elbows also restricts the poses and movement you get from her arms. These toys also have a balljointed head, but the size of the heads means that cannot move as much as you'd like; a second balljoint at the neck would fix this and give the toys more poseability, though it isn't as notable with Harley as it is with the flying Superhero Girls. Harley features only one accessory, a riff on her now-infamous hammer, and it's not a bad accessory, but it does feel cheap. Photos will not do it justice, but the main section of the hammer is very thin and does not feel durable. She can hold it fairly well, but a more substantial bulk to it would have made for a better accessory. Although I do understand the risk of giving a figure a heavy accessory making it difficult for her to stand, in this case it appears flimsy. You can't give this to any of your other Harley figures, for example. The fact that it is only two colors doesn't help, either, instead of featuring any actual paint or detail. And that's it - the only accessory she gets. Most of the other toys in the line are in the same boat, starved for accessories, which is sad because A) these are not cheap toys, and could subsequently do with more accessories to make them more appealing value, and B) because a line like this aimed at girls is invariably going to have comparisons to Mattel's major girl-oriented line, Barbie and its imitators, all of which feature a lot of accessories in order to give more for the girls to dress up and play with. Obviously these toys, as action figures, do not invite dress-up, but giving them some accessories, like Batgirl's backpack, is something additional for play and display, and that's a missed opportunity here, especially with a character like Harley. And so that's the Superhero Girls Harley Quinn. Overall, she's a good figure, in a good line, but it's the minutia that lets her down. Instead of an all-star stellar standout line, Mattel has taken a few cheaper options when it comes to these characters and stops them from being must-own. But these toys are still a lot of fun, and Harley is no exception.